This song is literally everywhere at the minute (it's currently March - this blog is backdated to the end of January) and has been rising in listeners due to the Samsung using it during their Unpacked Live Event which revealed the Samsung Galaxy S9. Not only that, but the song have been used in various other places recently, finally allowing Aston Merrygold to gain attention for this song. It's certainly catchy, although I'm not so keen on the track itself. The hook at the start of the chorus is what draws us in, but the rest just spoils the track, which explains why Samsung only used the first half of the chorus for their live event. 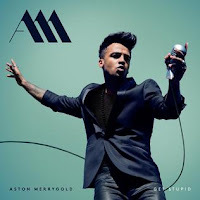 Watch Aston Merrygold, from JLS, dance around the shopping mall in his debut music video for the song "Get Stupid". Aston Merrygold is best known for being a member of British boy band JLS, who came second on the fifth series of The X Factor - which Alexandra Burke won. The group went on to have a number of hits before parting ways and they will forever have established themselves in British music. Aston Merrygold has always been interested in a solo career, so it's not a surprise that he is now going it alone, although his latest releases haven't gained traction, if any at all; not only that, but he also appeared on Strictly Come Dancing, so he can only hope that that helps him, music wise. He's always come across arrogant, to me, and I don't think he could shake that from my perception of him, as much as he may try. This song actually managed to chart at number 22 in the UK, number 10 in Australia, number 15 in Scotland, and number 72 in Ireland. "Get Stupid" was written by Aston Merrygold, Karen Poole, and Sonny J Mason. Directed by James Lees, this music video is set at the Del Amo Fashion Centre in Torrance, California. It has a staring narrative that turns into a performance visual. I certainly can't knock Aston Merrygold's dance ability because it is certainly of a high quality. The start comes off completely staged, to the extent that it's flat-out uninteresting to watch - where is this singer-songwriter's acting ability? - regardless, it doesn't last for long and we quickly jump into the song. It's clear that Aston Merrygold loves to show his dance ability with backing dancers, which does come across a little like he's still in JLS. The rest of the music video sees him enjoying himself throughout, with the choreography relating to the song as he performs with a spring in his step. He is loving his life in the shopping mall - I wish I had that sort of energy on a daily basis. The ending sees him walk out. It's bright, it's catchy, it's fun, but does it really relate?